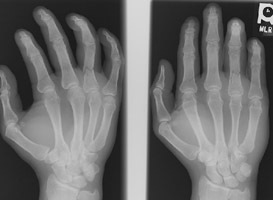 Phalangeal fractures of the hand are due to direct trauma or twisting injuries. Proximal phalanx fractures are the most serious. These fractures may disrupt or adhese the extensor or flexor mechanisms with loss of mobility of the fingers. Distal phalanx injuries are typically due to crush mechanisms. A Lateral radiograph of the hand. This demonstrates an angulated fracture of the fourth proximal phalanx. B PA and oblique radiographs of the hand. The also show the fracture of the fourth proximal phalanx. C Oblique radiographs of the fourth PIP joint. This demonstrates apparent overriding of the proximal and middle phalanges. D Lateral radiograph of the fourth PIP. This shows dislocation of this joint. E Oblique radiograph of the first digit. This shows a fracture of the distal phalanx. F PA radiograph of the first digit. This also shows the distal phalanx fracture.